The new Hatteras 77 Convertible appeals to both cruisers and sportfisherman thanks to its customer-driven interior layout options and industry-leading specifications in beam, draft, fuel capacity and accommodation space. Like all Hatteras yachts, the 77 Convertible is built on a solid-fiberglass hull with Dinvinycell coring in the decks, bulkheads and hullsides above the waterline. She features a length of 76'10", a 22' beam and a shallow draft of 5'3", easily the best in her class. The 77 Convertible features enclosed flybridge and sweeping interior stairwell as standard. The bridge is equipped with forward-facing seating for captain and four guests, thanks to a centered helm chair and two wide riding seats to port and starboard. 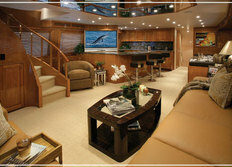 Aft, a raised sectional provides the comfort of a Sky Lounge area but is built to house rod storage below. Opposite the sofa is a 32-inch flat-screen TV and entertainment area with dry bar and combination refrigerator/icemaker. The forward console is designed to house up to five flat-screen displays and features a convertible-style steering station with single-lever electronic controls. The standard helm includes Hatteras' computer-based systems monitor that monitors ship's systems, engine diagnostics, fuel transfer systems, tank levels and more through a touch-screen display.